It is perhaps not too early to start standing in line for the final performance of the River City Men’s Chorus 2013 Holiday Concert. The first performances (Sunday) was overflowing. The final performances are tonight (Monday, December 2) and Thursday, December 5th at 7pm. Under the leadership of conductor and artistic director David Glaze, the River City Men’s Chorus concert ranges from the sublime to the silly. There are times it is hard to tell who is having more fun or is more moved – the audience or the singers. 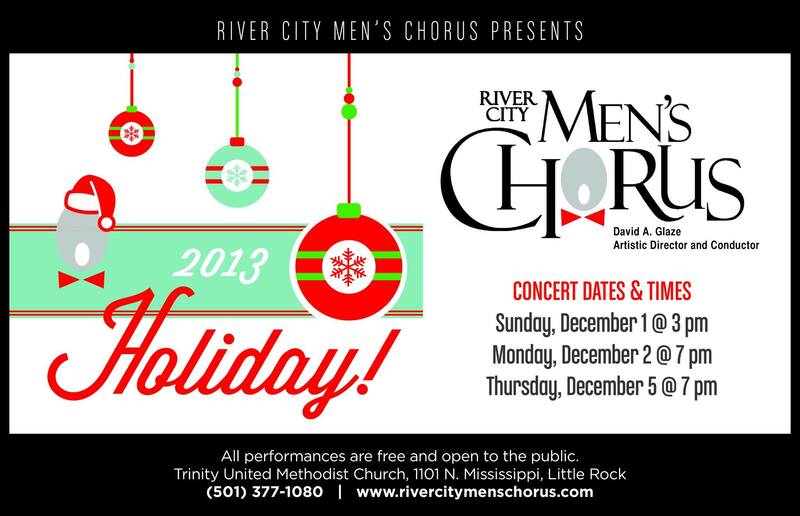 The River City Men’s Chorus ushers in the holiday season with its annual concert that combines traditional Christmas songs such as “O Holy Night” and “Hark, The Herald Angels Sing” with favorites like “Let It Snow” and “Have Yourself A Merry Little Christmas” along with some other wonderful surprises. The concert takes place at Trinity Methodist Church at 1101 N. Mississippi St. The concert starts at 7pm. Doors to auditorium typically open an hour early for the free, open seating. If weather is inclement, doors to the church (but not auditorium) will be opened even earlier so that audience members can stay warm and dry. This entry was posted in Holidays, Music and tagged David Glaze, River City Men's Chorus, Trinity United Methodist Church by Scott. Bookmark the permalink.